Encephalartos caffer , a.k.a. the Caffrarian Cycad, is a rare dwarf, subterranean-stemmed cycad, and the southernmost cycad species in South Africa. 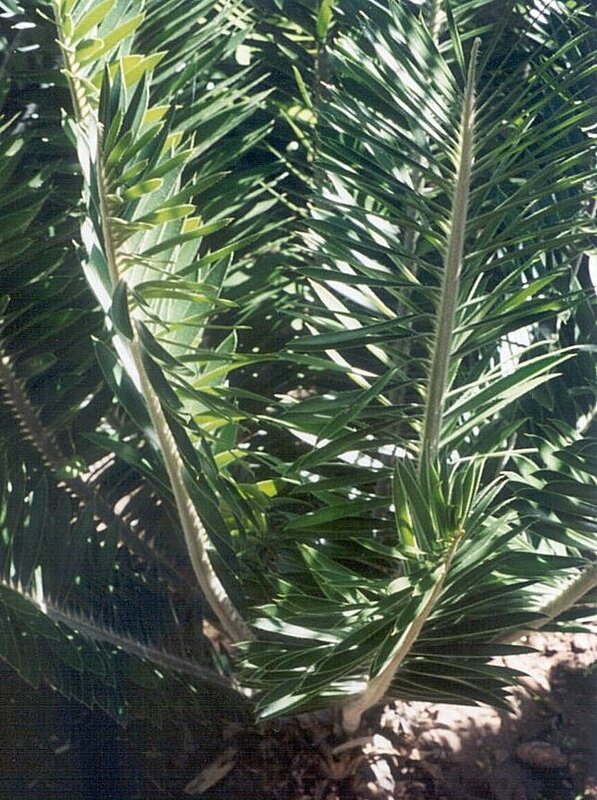 A distinctive characteristic of Encephalartos caffer is the ruffled, almost feathery (plumose) appearance of its leaves. This is caused by the leaflets crowding and the emerging from the leaf in different planes, sometimes irregularly twisting. Encephalartos caffer leaves are light green and range from 16-40 inches long. New leaves emerge brown and woolly, losing their wool as they mature. Leaflets are usually 3-4 inches long and approximately 3/8 inch wide, gradually becoming narrower from the base and ending in a sharp tip. Click here to see an enlarged photo of Encephalartos caffer .